Your at-home facial routine just got a whole lot better. 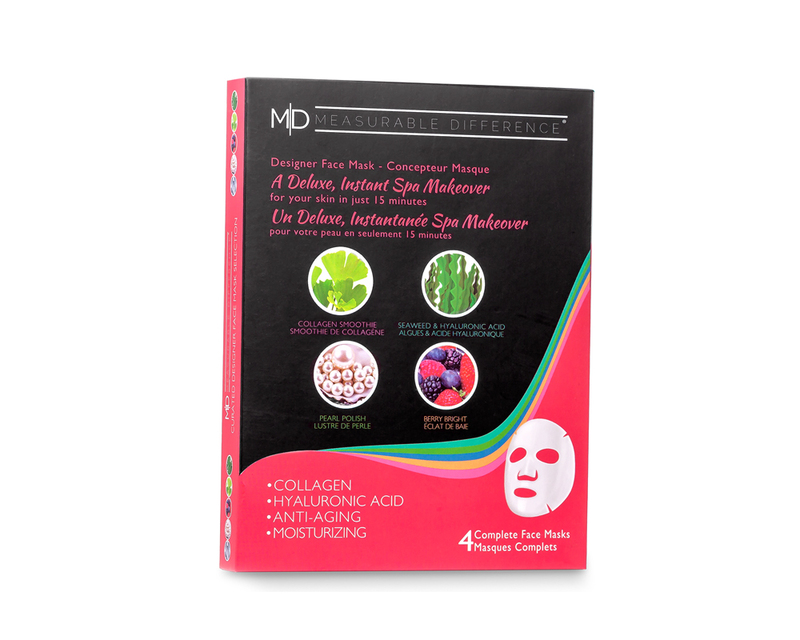 This luxe face mask pack comes with four different mask formulas to attack and and all skin issues. Whether you're looking to purify, hydrate, calm or brighten, this pack delivers. And don't worry about messy, sloppy application. These sheet masks are soaked in the skincare formula of your choice and can be directly applied to the face. So all you have to do is sit back and let the ingredients work their magic on your complexion. DIRECTIONS: Select a Designer Mask to address your specific skin condition. Apply the pre-treated cloth mask to freshly cleansed, towel-blotted skin and allow mask to activate for 15 minutes. After 15 minutes, remove mask and lightly massage remaining product into skin to intensify the action of the mask, gently pat serum into skin for maximum results. A deluxe, instant spa makeover for your skin in just 15 minutes! INGREDIENTS: Water, Glycerin, Alcohol, Glycereth-26, Sodium Hyaluronate, Betaine, Trehalose, Algae Extract, Hydrolyzed Collagen, Hamamelis Virginiana (Witch Hazel) Water, Citrus Paradisi (Grapefruit) Fruit Extract, Boswellia Carterii Resin Extract, Geranium Maculatum Extract, Rosmarinus Officinalis (Rosemary) Leaf Extract, Cymbopogon Schoenanthus Extract, Melissa Officinalis Leaf Extract, Calendula Officinalis Flower Extract, Salvia Officinalis (Sage) Leaf Extract, Monarda Didyma Leaf Extract, Artemisia Princeps Leaf Extract, Aloe Barbadensis Leaf Extract, Althaea Rosea Flower Extract, PEG-60 Hydrogenated Castor Oil, Adenosine, Niacinamide, Xanthan Gum, Carbomer, Triethanolamine, Phenoxyethanol, Methylparaben, Disodium EDTA, Fragrance, Ginkgo Biloba Leaf Extract, Leaf Extract, Camellia Sinensis Leaf Extract, Lavandula Angustifolia (Lavender) Flower Extract, Chamomilla Recutita (Matricaria) Flower Extract, Rubus Coreanus Fruit Extract, Scutellaria Baicalensis Root Extract, Angelica Dahurica Root Extract, Morus Alba Bark Extract, Nelumbo Nucifera Flower Extract, Silk Extract, Melaleuca Alternifolia (Tea Tree) Leaf Oil, Acetyl Hexapeptide-8, Copper Tripeptide-1, Psidium Guajava Leaf Extract, Rosa Hybrid Flower Extract, Arctostaphylos Uva Ursi Leaf Extract, Rubus Idaeus (Raspberry) Fruit Extract, Fragaria Chiloensis (Strawberry) Fruit Extract, Vaccinium Angustifolium (Blueberry) Fruit Extract, Rubus Fruticosus (Blackberry) Fruit Extract, Propylene Glycol, Panthenol, Cholesterol, Beta-Sitosterol, Choleth-24, Ceteth-24, Biotin, Ascorbyl Tetraisopalmitate, Niacinamide DEA-Cetyl Phosphate, Tocopheryl Acetate, Glyceryl Linoleate, Glyceryl Arachidonate, Dimethicone, Cyclomethicone, Ubiquinone, Pearl Extract, Punica Granatum Fruit Extract, Goat Milk Extract, Cymbopogon Schoenanthus Extract.